The sole test for inclusion in the NRC is citizenship under the Constitution of India and under the Citizenship Act including Section 6A thereof, the Bench said. The Supreme Court, in Kamalakhya Dey Purkayasth vs Union of India, has held that citizens who are originally inhabitants/residents of the State of Assam and those who are not are at par for inclusion in the National Register of Citizens (NRC). The bench was considering a batch of writ petitions seeking a direction or clarification as to the meaning of the term “originally inhabitants of the State of Assam” appearing in Clause 3(3) of the Schedule (Special Provisions as to manner of Preparation of National Register of Indian Citizen in State of Assam) to the Citizenship (Registration of Citizens and Issues of National Identity Cards) Rules, 2003. The writ petitioners had contended that by the process of verification of the claims for inclusion in the NRC based on the claim to be originally inhabitants of the State of Assam, a superior class of citizens is being created. The petitioners also submitted their apprehension before the court that the question who is originally inhabitant of the State of Assam might also have impact on the entitlement of such persons in the matter of opportunities for education, employment etc vis-a-vis the second category of citizens i.e. who are not originally inhabitants of Assam. 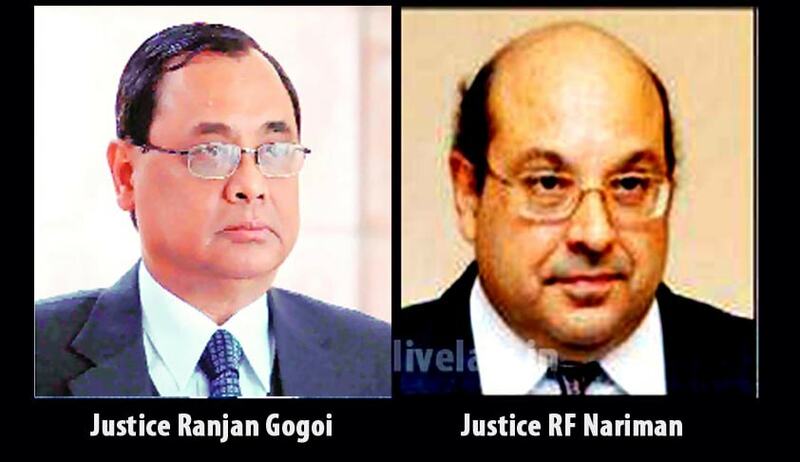 The bench of Justice Ranjan Gogoi and Justice RF Nariman observed that all such apprehensions are ‘wholly unfounded’ as the exercise of upgrade of NRC is not intended to be one for identification and determination of who are originally inhabitants of the state of Assam. The sole test for inclusion in the NRC is citizenship under the Constitution of India and under the Citizenship Act including Section 6A thereof. Citizens who are originally inhabitants/residents of the State of Assam and those who are not are at par for inclusion in the NRC, the bench said. Last week, the same bench had pulled up the Centre for slow progress in issues like updating the National Register of Citizens (NRC) and fencing of Indo-Bangladesh border.